Christmas Eve in 2008, was a mild introduction to a Japanese winter in the mountains of Iwate. I had no idea how cold it can get and how much snow can fall in just two days. Living on the East coast of Scotland usually means the sea breeze keeps the snow fall to a minimum and on the rare occasion of a blizzard, Edinburgh council turn the winter wonderland into brown slush thanks to a rally of road gritters and rock salt. This is the real thing. The frosted epicenter of a C.S. Lewis narrative. The snow has stopped but will continue into the New Year. Outside the white stuff easily clears my waist sealing my decision to stay here for a while. Stepping through the glass doors of the resort, everything changes – expensive sportswear, snowboots, boards and skis are racked up like armor. You choose your weapon carefully and exit the building into an arcade of mental and physical challenges. Skipping over to the chairlift like a new born snow leopard (there was a distinct lack of fur on this cub), I was transported higher into the heavens of Iwate. I managed to gallantly throw myself down several of the intermediate runs without killing myself. The only injuries sustained were muscular and the most painful was due to passing out on pillows filled with hard beads the previous night. Just another of Japan´s quirky little differences. Why they fill them with plastic beads and not feathers, I will never know – perhaps it is so that stupid white men like me, pampered like children with Egyptian cotton and duck feathered pillows, ´crick´ their neck. 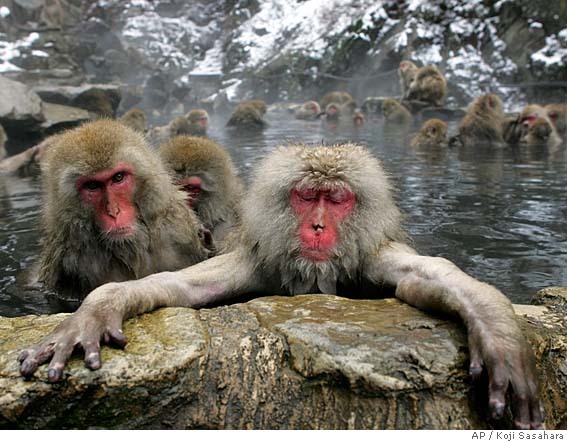 The added bonus of this adventure – apart from attractive manga girls luring you into the path of high speed tow bars, has to be the luxurious Japanese Onsen (hot spring baths) provided for established writers and other respectable elderly members of society such as myself. The fear of being ejected from the premises for exposing my tattoos in the communal baths has surpassed and I now proudly skip from hot tub to steam room without a care in the world. So far my beating heart has withstood the insane pressure of removing myself from a sweltering seventy degrees and plunging myself into a cool pool of around five. Not bad for an ex-smoker. Glad it´s no longer me puffing away outside the chairlift whilst conveniently leaning on another beer dispenser. Irony sits proudly on a plinth right next to heart disease, lung cancer and winter sports in Japan. 90% of the comfortably well-off that come to these resorts probably think I am romanticizing a ´dip in the pool´, but my faith in humanity clings to the 10% that sat beside me as the hot volcanic waters evaporate into the mountains early offerings of snow. Each snowflake seems to represent the toils of modern civilization; the love lost, the sickness and the strain. As the crystalline fingertips hit the surface and melt into the warm embrace of her liquid lover, the significance of each painful memory becomes irrelevant. When we are lost in a shopping mall, wrapped in plastic and designer labels, it is hard to imagine removing our layers of armor and forgetting the superficial world we live in. Here in Japan that luxury is possible. Thanks to these memoirs, I will never forget the feeling of being back inside the womb whilst literally a tiptoe away from the world of Narnia. An experience I unfortunately shared with no other, but one that reinforces the delicate balance, beautifully exposed in its tender moment, between man and Mother Nature. I´ll take that one to the grave. “The frosted epicenter of a C.S. Lewis narrative.” — That, my friend, is poetry!